Amazon Smile will donate .5% of your purchases to CAA at no cost to you! All you do is link to our Amazon Smile account. Did you know Amazon will now donate .5% of the purchase price of every eligible Amazon purchase at no cost to you? It’s true! Just log in at http://smile.amazon.com/ and select Clatsop Animal Assistance as your charity. Clicking on the Supporting button at the top left of the page and then enter Clatsop Animal Assistance as your choice. You only need to do this once – CAA is now your selected charity every time you shop at Amazon through the AmazonSmile page. Now, it’s true that .5% isn’t much but it adds $5 of service to animals for every $1,000 spent at Amazon through the Smile account. And remember, this donation is at no cost to you ! Won’t you take a moment next time you are on Amazon and link to our Smile account? We thank you and the animals thank you. Clatsop Animal Assistance works hard to spend as close as possible to 100% of its revenues to expenses directly benefiting animal adoption and animal welfare. $1,000.00 pays for one week of veterinary care. Odin (known as Dobby while he was at the shelter) was adopted in the fall of 2013 and we still hear from his people, who tell us he’s being “spoiled rotten.” Can you tell? When Odin first came to the shelter, we weren’t sure whether he would need expensive surgery for wobbler syndrome, a non-fatal but painful cervical spine condition seen in many large dogs, including Dobermans. CAA covered the $1,788.00 for the tests that showed he could live a long, happy life with no surgery. Without CAA’s help, Odin may not have been adoptable because of the uncertainty of his condition and the likelihood it would cost several thousand dollars to treat it. With your support, we can continue to give shelter dogs and cats like Odin a second chance at a happy home. Just click on the PayPal logo below or mail your donation to CAA, PO Box 622, Warrenton, OR 97146. Rachel, Jason, Katie, Jane, Natalie, Julie, and Emma: all adorable Beagle-Bichon puppies that came into the shelter in November 2013 with parvovirus, a hihgly contagious and life-threatening viral disease. After several days at the vet getting intensive care, they came back to the shelter, where they were quarantined until each one received a clean bill of health. All have now been adopted into loving homes. 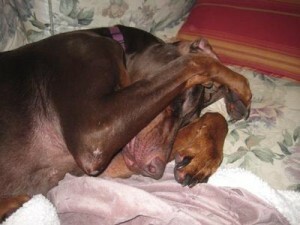 CAA covered the vet care and medication costs totaling close to $4,300.00. We couldn’t have done it without your support. Without this care, the puppies might not have made it and certainly would not have been adoptable. We thank you, the puppies thank you, and the adopting pet parents thank you. Are you part of the Fred Meyer Rewards program? 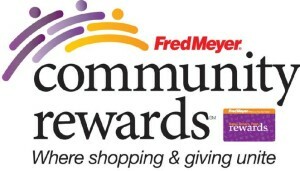 You can now link your Rewards cards to CAA (number 88047) at www.fredmeyer.com/communityrewards. Search for us either by name or number. Once you’re linked, you still earn all points and rebates and Fred Meyer makes a donation every time you shop; it’s as easy as that. If you don’t have a Rewards Card, you can obtain one at the customer service desk of any Fred Meyer store. Because the program is such a success, Fred Meyer is committed to donating $2.6 million in 2015 to nonprofits in Oregon, Idaho, Washington, and Alaska, based on what you as customers select as your favorite causes. Thank you to all of our supporters and to Fred Meyer for your community support! Poor Shrek was half starved and had bite marks all over his body. A good Samaritan found Shrek wandering on Mount St. Helen’s. He was injured, with bite marks all over his body, indicating that he had been a bait dog. Celestine (our good Samaritan) brought him in to the animal shelter, so that he could receive veterinary care and have a place to recover. Shrek needed surgery for his entropion eyes (the lids folding inwards, instead of outwards) as well as medications for his other injuries and infections. CAA covered his vet and medication bills and our volunteers helped give him the loving attention he needed. Best of all, this story has a perfect ending: Shrek is now happily at home with Celestine and her dog. He is also a frequent visitors to our holiday season bake sale. Blue good as new after $1,200 ACL surgery, some PT and lots o TLC in foster care at a volunteer’s home. 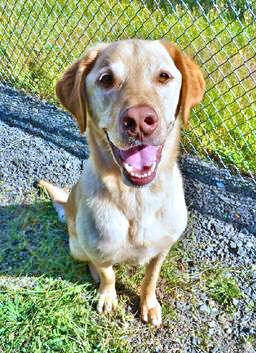 Blue, a four year old Yellow Lab, came to shelter in the spring of 2014 after tearing his ACL while trying to jump a fence. It took a combination of $1,200 surgery and several months of foster care to nurse this boy back to health. His foster family, who volunteer at the shelter, gave him cold and heat therapies, massage, stretching, and an exercise regime, as well as lots of love. They said he was “77 pounds of darling boy.” Blue is now happily in his forever home, thanks to our supporters and volunteers.